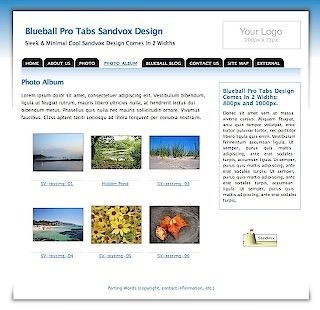 Third-party companies have been working on new Sandvox designs, and we're pleased to share the news that Blueball Design recently announced the availability of their first Sandvox design, "Blueball Pro Tabs." We've had a number of users create designs for their own sites, but Blueball is the first with a full commercial release of a new design. Unlike our built-in Sandvox designs, which assume that the main content area is 800 pixels wide, the Blueball design comes with a 1000-pixel-wide variation. We're looking forward to more designs from Blueball and other companies, and yes, we'll continue to add new built-in designs to Sandvox, too!